Robi Yonder Music: The Spotify of Bangladesh? Music is a sensitive and controversial topic in Bangladesh. Why? Because of the crazy degree of piracy that exists in the industry. Not only is this piracy causing immense damage to our local artists, it has become the norm in modern day Bangladesh. Robi Yonder Music is an application exclusive to Robi subscribers that aims to solve this problem by giving users access to unlimited local and international music free of charge. Yonder’s music catalogue includes content from Universal Music Group, Sony and Warner Music Group in addition to independent record labels so we expect most of the international content to be from artists associated with the respective record labels. Robi partnered with Yonder Music, a US based mobile-only digital music download service, to make this application. It is available on iOS and Android but our friends over on Windows Phone have been left out. 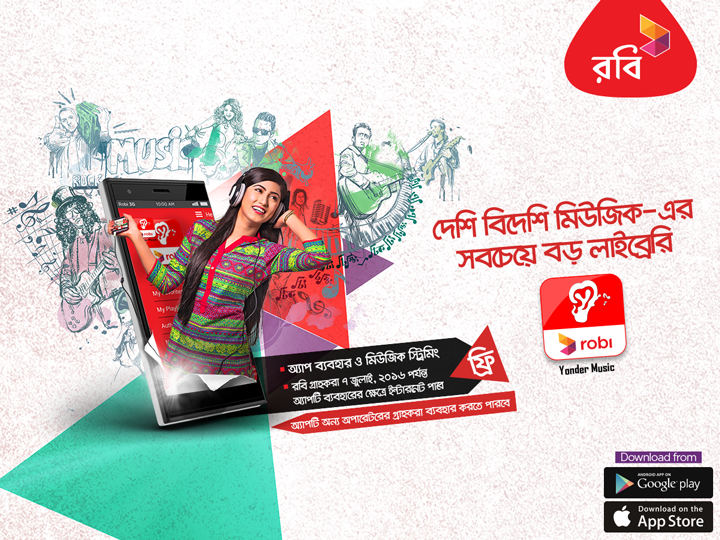 Robi subscribers can download the app here. After that, all you have to do is sign up with your email address or Facebook ID and you’re all set. All you need is an active internet connection, whether that be over WiFi or mobile data. There are no application charges, no per-track download fees and no subscription fees. Songs are cached on your phone to enable offline playback too. A fee proportional to the number of times a song is played will be paid directly to the respective artist by Robi Yonder Music service. This is an excellent initiative by Robi to support artists across the globe while offering free music streaming to its subscribers. The app should help alleviate the piracy situation significantly in Bangladesh and support our own local artists. The app is much more convenient and secure than pirating music and should thus encourage users to avail the service instead of piracy. Walton Primo R4s: Primo R4 with an extra RAM to launch soon! Do you know anything about charging modality? And can non robi users use?